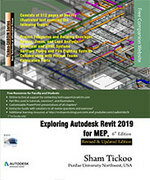 Exploring Autodesk Revit 2019 for MEP textbook covers the detailed description of all basic and advanced workflows and tools to accomplish an MEPF (Mechanical, Electrical, Plumbing, and Fire Fighting) project in a BIM environment. It explores the processes involved in Building Information Modeling. The topics covered in this textbook range from creating building components, HVAC system, electrical system, plumbing system, and Fire protection system to designing conceptual massing, performing HVAC heating and loading analysis, and creating rich construction documentation. In this textbook, special emphasis has been laid on the concepts of space modeling and tools to create systems for all disciplines (MEP). Each concept in this textbook is explained using the detailed description and relevant graphical examples and illustrations. The accompanying tutorials and exercises, which relate to the real world projects, help you understand the usage and abilities of the tools available in Autodesk Revit 2019. In addition, the chapters in this textbook are punctuated with tips and notes to make the concepts clear, thereby enabling the readers to create their own innovative projects. Comprehensive textbook that covers all major Revit MEP tools and concepts. Coverage of advanced concepts such as worksharing, families, and system creation. Detailed description on building envelope, spaces and zones, HVAC system, electrical system, fire fighting system, and plumbing system. Step-by-step explanation that guides the users through the learning process. Effectively communicates the utility of Revit 2019 for MEP. Self-Evaluation Test and Review Questions at the end of chapters for self assessment.